Rice Bucket Challenge. How to Participate in Rice Bucket Challenge. #RiceBucketChallenge Donations. Manju Latha Kalanidhi. 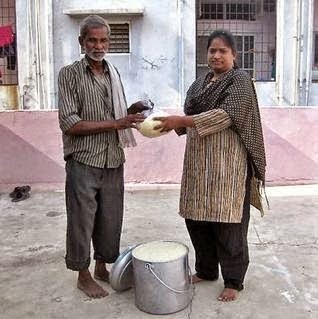 Rice bucket challenge has been started in India by Manju Latha Kalanidhi. So many people in India are now accepting this challenge and donating rice to the needy people around them. Manju Latha Kalanidhi has started a facebook page for this challenge and has got tremendous response from the people. It has got 9140 face book like so far. The page has been stared on the 23rd of August 2014. It has got 1000 face book likes in just 24 hours and has got about 5000 likes on the second day. How to participate in Rice Bucket Challenge? Are you ready for the challenge? If yes, as said above donate the needy persons with a bowl of rice and take photograph of that and post it on to the facebook page of this challenge.